Thank you for visiting www.embassyboulevard.com. 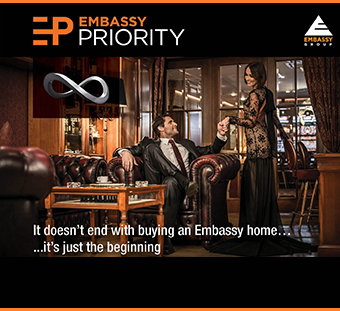 The website of the project Embassy Boulevard, www.embassyboulevard.com is the property of Embassy Property Developments Limited ("EDPL"). We respect your privacy and consider it an important element of our business. We do not collect personal information about you when you visit our website(s) unless you volunteer to provide that information to us. We collect personal information from you only if you provide it voluntarily. The types of personally identifiable information that may be collected by us include name, address, e-mail address and information about your interests in Embassy Boulevard and the property management services required by you. This information is collected and stored for the purpose of taking action. This is primarily property related. No information will be shared with any third party. The Login and password details will be kept strictly confidential and has been created for your easy reference as an investor in the project. Part of the purchase cycle like payment schedules etc will be privy to you through the Login. This Agreement shall be governed by and construed in accordance with the applicable laws in India. This Agreement shall be deemed to have been entered into Bangalore (Bengaluru), India and the courts in Bangalore (Bengaluru) alone will have exclusive jurisdiction to entertain any proceedings in any way relating to or concerning this Agreement or any rights, duties, obligations or liabilities arising thereunder.